L esser Thatching Materials… Not gone or forgotten. 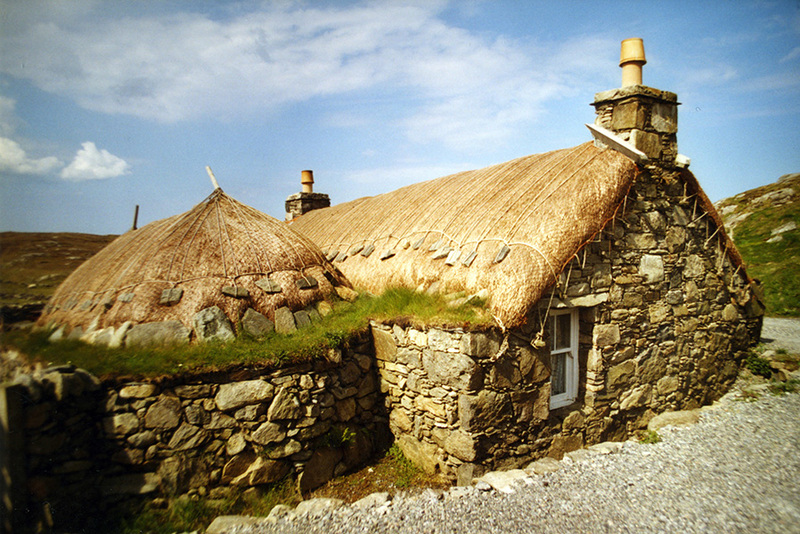 ‘Lesser‘ only in the sense, that the following thatching materials are less commonly used. In many cases these other materials give as good a service, if not better, than their more popular rivals. The sections on long straw and combed wheat reed, also apply to the harvest and preparation, of the other cultivated thatching materials; the straw from Oats, Barley and Rye. No wheat … Barley is the material of choice, here on the Isle of Lewis. The Northern Isles prefer Oat straw. Heather or Ling thatching enjoyed a great vogue, around a century ago. No end of summerhouses and pavilions were created, using this rustic material. Most of these have long gone. As have many of the countless houses, once covered in this material and with them the managed areas of land, producing heather. 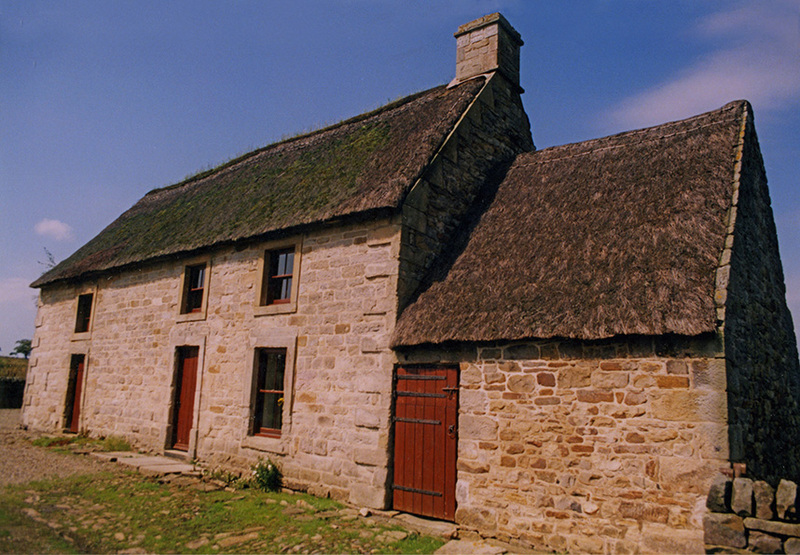 Most heather found on hill and moor is far too short for use as thatch. The regular regime of managing heather moors; that of burning and grazing, would need to be stopped for the plant to reach a good length. Three to four foot (900 /1200mm) long heather plants are ideal for thatching. Harvesting is hard work, a reason perhaps for the plant’s decline as thatch. Spring is the best season for harvesting, the heather is pulled up roots and all; and tied into smallish regularly sized bundles. These are then fixed, as bundles, on to the roof, using the standard long straw method; but with their heads facing down. The coatwork tends to be a little thinner than a straw thatch and it certainly does not have the neat appearance of reed. But heather has a good reputation for longevity. Marram Grass… On the Island of Benbecula. The area around the island’s airport is a useful resource, supplying material for several other Hebridian islands. With Marram Grass or Bent, the management of the crop is vital. Like water reed, the area needs regular cropping to get a useful harvest. In fact the dry plant looks like a smaller version of water reed, growing to around three feet (900mm) in length. This grass is a lot tougher than most cereal straw. If the ground is suitable, it can be cut with a tractor and grass mower but will need to be tied by hand. In times past its use was widespread; being recorded in both South Wales and other areas. 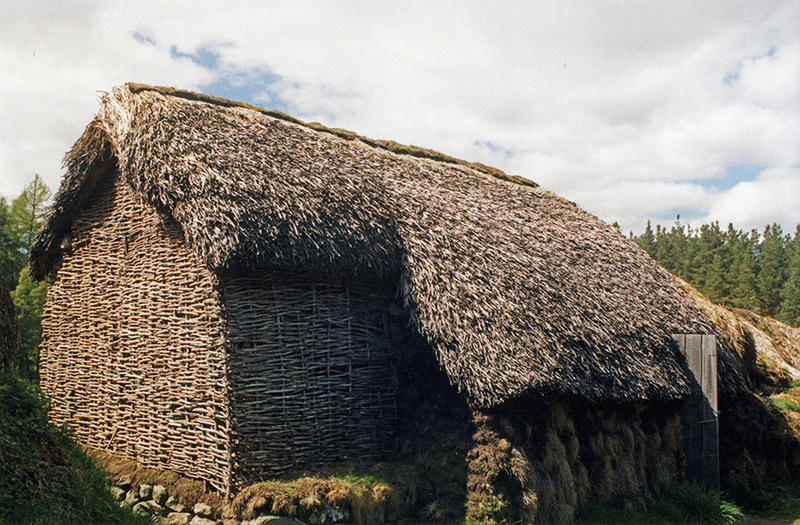 Modern usage, is now mainly in the Isle of Man and the Hebrides, being used exclusively in directional thatching. Common Rush… held in place with weighted wire netting; at Laidhay Croft, in Caithness. The surrounding land supplies the crop… Photo; kind permission Laidhay Croft Museum. The Common Rush, is now also confined to use with the directional method. 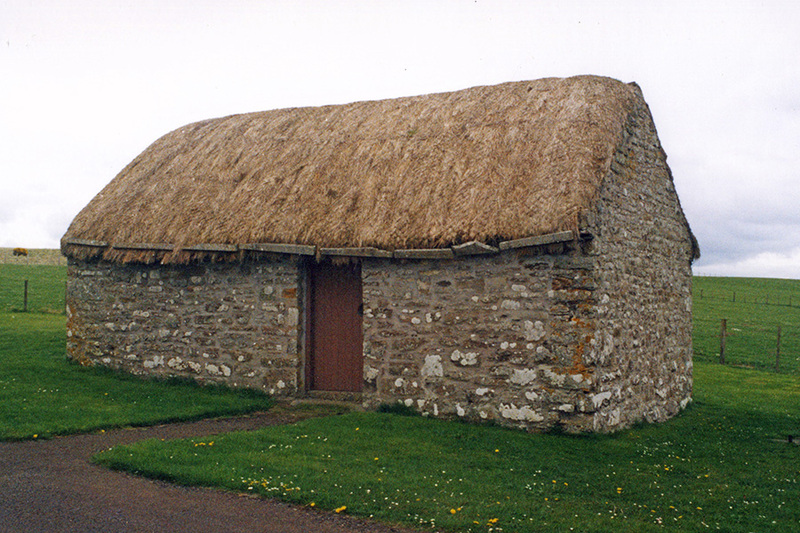 It often surrounds many of the buildings it now covers, mainly in Northern Scotland. Again this material was once much more widely used, being specifically banned, along with water reed, from the City of London in 1212. The plants grow to around three feet (900mm) each year. And is best cut and used while green. Broom or Whin is tall and robust; a shrub growing to around four feet (1200mm) high or so, over several years. This can be used heads down in a similar fashion to heather. In the past separate branches were pushed up into a turf base. Like heather, broom makes a long lasting thatch. It was once very popular, in the northern half of Britain; but now is hardly seen. This is also the case with Bracken. Like heather, this is pulled up roots and all. 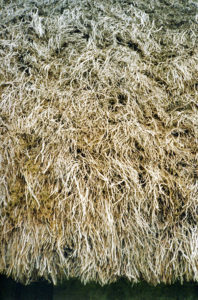 The foliage is then stripped, only the stems being used in a standard method of thatching. Giving a long lasting and sound thatch. 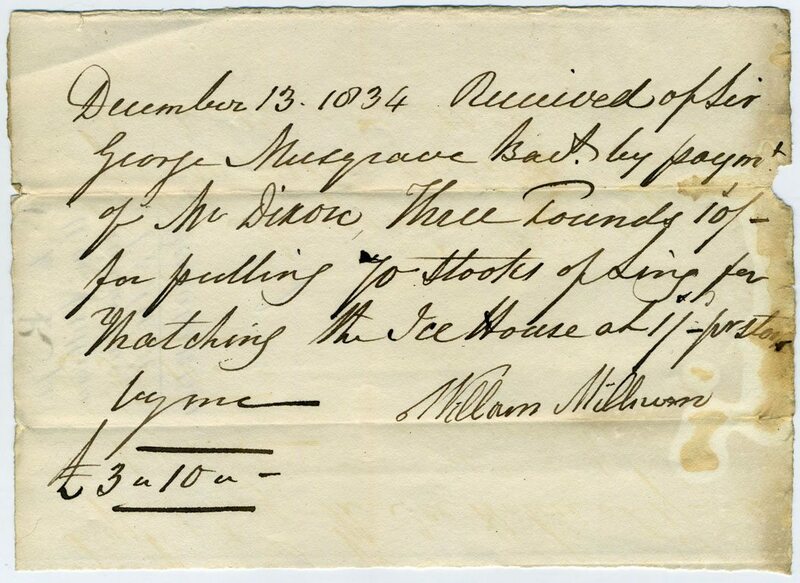 It was also used unstripped, in a directional manner. Broom and Bracken… Confined to the museum. 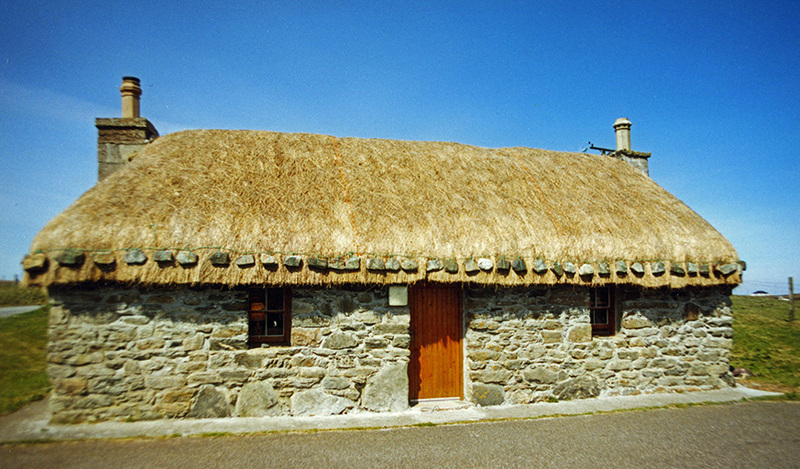 These reconstructed turf walled buildings, show both broom and above a roof of bracken, both viable and long lasting thatching materials. 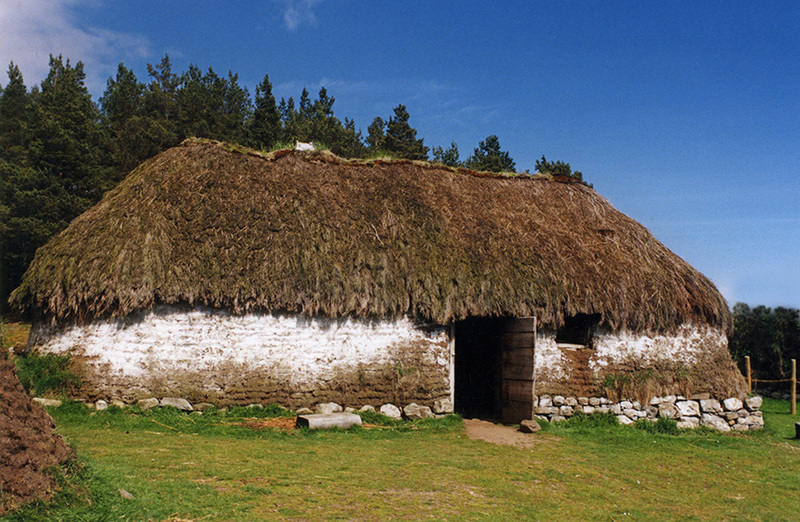 Thousands of examples, of these types of thatched building, were swept away during the Highland Clearances, leaving no trace. Photos; kind permission Highland Folk Museum.